LONDON -- An American was among more than a dozen people killed when gunfire and explosions erupted at a high-end hotel complex in Nairobi, Kenya, on Tuesday afternoon, according to the U.S. State Department and those who knew him. Jason Spindler "was tragically among the fatalities," the company he founded, I-DEV International, told ABC News in an email Wednesday. The San Francisco-based strategy and investment advisory firm has an office in Kenya's capital, and Spindler served as the firm's managing director. A State Department official, who confirmed that an American was among the dead, condemned the "senseless act of violence" at the multi-use complex in Nairobi's affluent Westlands neighborhood, which includes the upscale DusitD2 hotel, which is popular among foreigners. The American embassy there is closely monitoring the incident and the State Department has offered assistance to local authorities, the official told ABC News. Kenyan President Uhuru Kenyatta said at least 14 people were killed in Tuesday's attack. "As of this moment, we have confirmation that 14 innocent lives were lost through the hands of these murderous terrorists, with others injured," Keyatta said in a broadcast Wednesday morning. "We are grieving as a country this morning, and my heart and the heart of every Kenyan goes out to the innocent men and women violated by senseless violence." The London-based Gatsby Charitable Foundation announced that its Africa programs director, Luke Potter, was also among the dead. "Luke had devoted the past 10 years of his career to helping some of the poorest and most vulnerable people in the world. He had worked with us for three-and-a-half years, carrying out assignments across East Africa," the charity said in a statement Wednesday. Kenyan authorities, who are calling the incident a terror attack, announced Wednesday morning that all buildings within the complex have been secured and the operation to neutralize the assailants was over. Kenyan Cabinet Secretary for Interior Fred Matiang'i said "scores of Kenyans and other nationalities" have been evacuated from the buildings following Tuesday's attack. On Tuesday evening, he confirmed that the complex had been secured after several hours of fighting. "The situation is under control, and the country is safe," Matiang'i said during a press conference Tuesday night. "Terrorism will never defeat us." Extremist group al-Shabab claimed responsibility for the assault, The Associated Press reported. The al-Qaida-linked group, based in neighboring Somalia, made the claim Tuesday via its radio arm. Al-Shabab has been responsible for several high-profile attacks across the border in Kenya in recent years, including ones that targeted the Westgate Shopping Mall in Nairobi in 2013 and a public university in Garissa in 2015. The United States has intensified airstrikes on the group's positions in Somalia in the past year. U.S. airstrikes killed more than 60 militants in December alone. But experts say that, overall, it appears the efforts to degrade al-Shabab's capabilities have been unsuccessful. "The attack on the DusitD2 hotel is most likely a response to these airstrikes, judging by the target - an upmarket hotel complex, popular with Westerners, in the heart of Nairobi rather than a Kenyan military base in Somalia," Alexander Sehmer, director of geopolitical intelligence at Falanx Assynt, told ABC News on Wednesday. "It allows al-Shabab to demonstrate their reach and of course has echoes of the Westgate Mall attack from 2013." Kenya's Inspector General of Police Joseph Boinnet said in a press statement that Tuesday's attack began around 3 p.m. local time when a "group of armed assailants" stormed the gated complex, which houses a hotel, restaurant, bars and offices. An explosion targeted three vehicles in the parking lot and a suicide bomber detonated inside the hotel foyer, where a number of guests suffered severe injuries, according to Boinnet. Video from the scene showed the cars ablaze and wounded people being carried away. Marvin Gitari, a videographer who works in an office within the complex, told ABC News that he saw the attackers after hearing the first blast. They had assault rifles and were wearing bulletproof vests strapped with ammunition magazines, he said. "They were quite armed, and they seemed strategic because they were shooting at anybody in groups of two and they were looking at guys who were peeping through the windows and shooting at them as well," Gitari told ABC News in an interview Wednesday near the scene in Nairobi's Westlands district. Gitari said he and his colleagues immediately switched off the lights in their office, turned off all the machines and locked themselves in the studio. Terrified for their lives, they stayed there until members of the Kenya Red Cross rescued them. "It was hell," Gitari said. "I never thought I would get out because the gunshots were becoming louder and louder by the minutes." 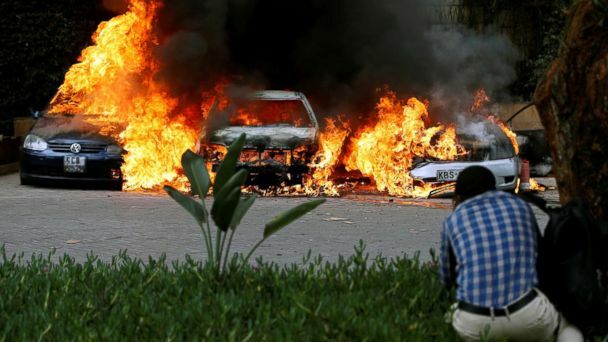 Kenya's National Police Service deployed special forces to the scene to engage the attackers, who were holed up inside the luxury hotel for hours. Meanwhile, the area was cordoned off as residents were screened and evacuated, according to Boinnet. Kenyan forces went floor by floor and building by building to secure the complex, Boinnet said. "Specialist forces are now currently flushing them out. However, we regret to inform that there have been injuries in the attack," the police inspector general said in a statement Tuesday night. The number of people who have been injured is unknown at this time. "We urge the public to remain calm and to cooperate with all security forces and to provide any information that they may deem as useful," Boinnet added. A spokesperson for the U.S. Department of State told ABC News on Tuesday that "all mission personnel are safe and accounted for." ABC News' Clark Bentson, Kaelyn Forde, Julia Jacobo, Zoe Magee, Luis Martinez, Elizabeth McLaughlin, Ian Pannell, Darren Reynolds and Bruno Roeber contributed to this report.